New Growth, New Hires | Tensor Machinery Ltd.
At Tensor Machinery, we believe the quality of our machines is a reflection of the quality of our people. Over the years, our reputation for advanced design has spread around the world, and demand for our innovative products continues to skyrocket. The past 12 months in particular have been an absolutely remarkable period of growth for Tensor. To maintain our superior standards, we have begun to grow our world-class team. 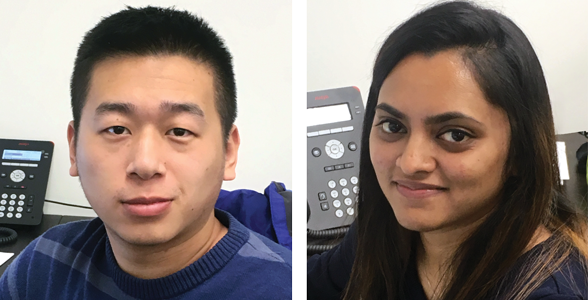 We are proud to announce two new key hires: William Sun, Machine Designer, and Mansi Murabiya, Electrical Engineer. Prior to coming to Tensor, William Sun studied Industrial Drafting at the Rosemount Technology Centre in Montreal. He also holds a Bachelor’s Degree from Zhejiang University of Finance and Economics. Mansi Murabiya has a Master’s Degree in Electrical and Computer Engineering from Concordia University and is also a graduate of Gujarat Technological University in Surat, India. Welcome to the Tensor team!